For repair of umbilical hernia with extraperitoneal mesh position. 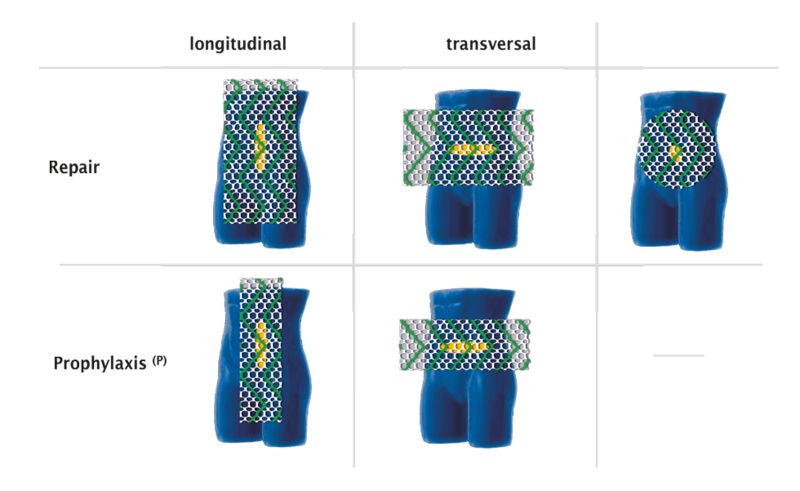 Because of its tri-elasticity, which is adapted to the anatomical and biomechanical properties (dynamometry) of the human abdominal wall, DynaMesh®-CICAT provides the highest possible degree of patient comfort. Following in-vivo incorporation, mesh implants have a tendency to “shrinkage”.DynaMesh®-CICAT has a high effective porosity of 61 %, enabling excellent incorporation of the mesh implant.Moreover, in the course of incorporation the use of the proven and highly biocompatible polymer PVDF contributes to a low degree of scarring.The optimal incorporation of the DynaMesh®-CICAT implant post-operatively,reduces the risk of shrinkage and recurrence. Skin incision 2 to max. 5 cm via hernial orifice (Fig. A). Display of hernial defect and preparation of the hernia sac. Optional: minimal opening of the hernia sac allowing for manual probing, followed by open or laparoscopic adhesiolysis. The peritoneum is freed up approx. 2 cm from the linea alba in a circular pattern and the posterior layer of the rectus muscle is freed. The posterior layer of the rectus muscle is opened laterally on both sides (instrument: EndoTORCH ) (Fig. B) about 1 cm from the medial border of the rectus muscle (Fig. C). Using long slim retractors and under endoscopic monitoring, the posterior layer of the rectus sheath is freed laparoscopically from the rectus muscle. In the midline endoscopically assisted dissection is performed in the preperitoneal plane: The peritoneum is freed up from the linea alba. The further totally extraperitoneal preparation is performed through the hernia, either under direct vision with laparoscopic instruments or with endoscopic assistance. The posterior layer of the rectus sheath generally remains open with a completely closed midline peritoneum. Placement and spreading of the DynaMesh®-CICAT mesh implant in the extraperitoneal cavity as a double roll and without skin contact. Fixation of the DynaMesh®-CICAT mesh implant is only required if the hernia defect cannot be completely closed and there is bridging of the hernia defect. The special anti-slip surface of the DynaMesh®-CICAT ensures the mesh stays in position and enables optimal handling. 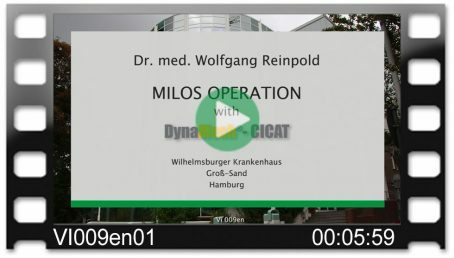 The light tube for the MILOS technique (Mini Less Open Sublay technique) was developed with Mr Wolfgang Reinpold, consultant at the Wilhelmsburger Groß-Sand Hospital, Hamburg, specially for laparoscopic-assisted treatment of abdominal wall hernias. For repair and prophylaxis of abdominal wall hernia with extraperitoneal mesh position. A requirement for lasting surgical success is that the implant must be correctly positioned. This is why we have incorporated green orientation strips into the implant. They must always run in the craniocaudal direction. The antislip surface ensures stable positioning of the mesh. It also facilitates handling and fixation. Excellent porosity allows direct contact of the tissue layers through the mesh and promotes rapid incorporation. Please note: for this reason, DynaMesh®-CICAT must not be placed intraperitoneally. The unique properties of the mesh lead to more rapid convalescence, long-term safety and the highest possible patient comfort.